The first time I visited France I was 16. My passion and love of food hadn’t quite developed yet, so I didn’t know what to expect. It was absolutely amazing. I spent a week in southern France with my mom, and since neither of us were very good at planning ahead — or really spoke French — we were in for a week of discovery. I remember the first night clearly. Trying to find a restaurant that was open, after a long flight, wasn’t easy. We stumbled into some outdoor seating area in a fantastic garden — the kind of gardens you would expect everywhere in cinematic Europe. While the scenery was breath taking, I’ll always remember the food from that night. We had snails, mushrooms and I’m pretty sure rabbit, too. Again, the language barrier didn’t make it easy to know exactly what we were ordering. And finally, we had BREAD. A fresh crusty baguette with butter. So plain and simple, yet I couldn’t stop eating it. The next morning we went straight to a bakery, to get more baguettes. That’s where I discovered what a true croissant tastes like. It must have been made with at least a pound of butter, and it was delicious. I ate three, ordered six to go, and still had to go back for more that same day. I didn’t keep track of everything I ate, or how much I actually consumed, but to this day I remember how tasty fresh bread can really be. 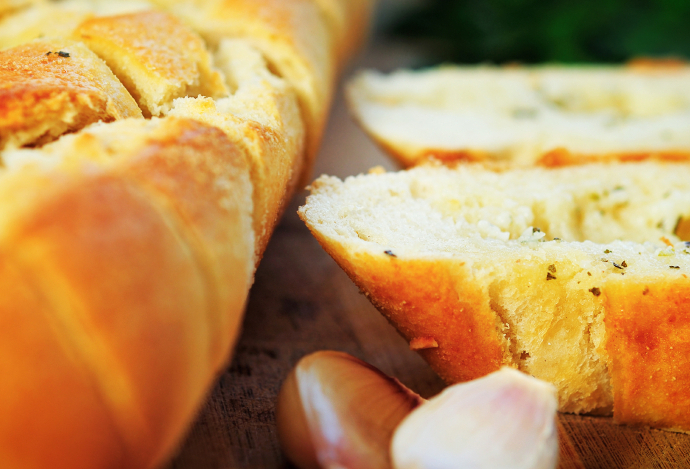 I don’t consider myself a baker by any means, but I enjoy baking fresh breads — the smell and taste takes me back to that tucked-away garden in France. Place an empty large cast-iron skillet in the oven to heat up. Mix all dry ingredients together. Mix egg and milk separately; set aside. Grate the frozen butter directly into the flour. Rub butter and flour mixture together for 30 seconds (enough to coat the butter in flour). Add cheddar and mix gently to incorporate. Add egg and milk; work the dough to incorporate the ingredients, but do not overmix (the dough should be holding together loosely). Press dough out to about 1-inch thickness (use your hands). Cut out circular biscuits. Take pan out of the oven, add remaining butter and let it melt; quickly place biscuits in pan and brush with egg wash. Return pan to oven. Bake for 15 minutes. (Do not open the oven.) Serve and enjoy.